Color Me Rad is coming to Saskatoon with a tsunami of color that will make colored tears of joy run down your cheeks and will renew your will to live. Color Me Rad is a 5K that fires off in a blaze of color bombs, color cannons, color mortars, and multi-toned courses that guarantee your outlook will be brighter, your boyfriend will be more affectionate, your boss will finally remember your name, the hair on your head will grow back and the hair on your back will fall out, and your gray outlook will turn green like a spring morning. Historically, running has only been acceptable when trying to escape the law, personal responsibility, the truth, and grizzly bears. Instead of running FROM something, get ready to run FOR something at this year's Color Me Rad. Run for the hell of it. Saskatoon Well Being Magazine article of the month. This is something we see around the gym far too often; a mother-to-be giving up on her workout due to pregnancy. True, under some circumstances it is not safe for an expecting mother to put the extra demand on her body. The bottom line is that the rules don't change; to maintain optimal health, positive mental state and desired physical appearance, exercise is your best bet. To take better care of your family, you need to take care of yourself first. Exercise will give you a sense of control of your changing body throughout pregnancy and boost your energy levels by releasing endorphins, which increases your feelings of well being. Establishing a regular fitness routine before becoming pregnant may help you maintain a consistent plan once you become pregnant, as well as when you return to exercise after having your baby. However, if you have not been active in the past, there are still many physical activities that you can safely begin now that will help you stay fit and healthy throughout your pregnancy. When you become pregnant, your exercise priorities will change to adjust to the emotional, physical and hormonal changes that occur in your body. Exercising while pregnant can be beneficial to improve your posture, strength and endurance, as well as help to relieve stress and prevent excessive weight gain. Consult your doctor throughout your pregnancy regarding your physical activity level and discuss any concerns should any complications arise. If you were active before becoming pregnant, continue with your program and listen to your body by making modifications as you need them. If you were not active before becoming pregnant, begin slowly and build gradually as you become more fit. Use the “talk test” to determine your level of intensity while performing aerobic activities; if you cannot talk during your exercise, you are working too strenuously. Pay attention to your temperature, since overheating can cause problems for your developing baby. Use fans or air conditioning while exercising and avoid over exertion on hot days outside in the sun. To help strengthen your pelvic floor muscles, Kegel exercises can be performed throughout your pregnancy, which will help with bladder control. During your second and third trimester try core-strengthening exercises on all fours, by simply contracting and relaxing your abdominal muscles and avoid lying on your back, which decreases blood flow to your baby. Avoid rapid changes in direction and bouncing, as your joints are more lax with an increase of hormones during pregnancy. A focus on balance exercises is important as your center of gravity changes, especially during your last trimester. During pregnancy, some effective forms of exercise include yoga stretches and Pilates movements, which use your own body weight, as well as resistance training using dumb bells and resistance bands. Using a body weight suspension training system, such as TRX, may also be useful since you can adjust the intensity of your strength training as your body and center of gravity changes. Using a TRX Suspension Trainer may also help you maintain balance for exercises such as squats. If you had a Caesarean delivery, begin with light exercises, such as walking and stretching, slowly based on your comfort level. Your 6-week postpartum evaluation is an opportunity to discuss with your healthcare provider a safe reintroduction of exercise into your lifestyle. If you were active during your pregnancy and had an uncomplicated vaginal delivery, you may typically begin walking and stretching within days after giving birth. You may have a gap in your abdominals and exercises like crunches should be avoided until this gap closes, usually 4-8 weeks postpartum. You may then begin strengthening exercises such as plank, side bridge and leg lowers lying on your back, which will help you regain posture and develop core strength. Listen to your body and slowly introduce aerobic and strength training activities that you enjoy and are familiar with. Develop a realistic plan of incorporating 30 minutes of activity three days per week. Remain flexible so you can adjust your workout intensity or length of exercise sessions with your unpredictable schedule and the added fatigue of caring for your newborn. If you are uncertain where to begin and would enjoy the company of other new parents, search for postnatal fitness classes that are led by a qualified exercise instructor. Take action! Write down any barriers to performing your workout and make a list of how you are going to overcome these barriers. Naturally, your main focus is going to be caring for your baby, but it is also important to look after yourself. As you remain fit, healthy and relaxed, you will be better able to care for your baby. Continuing to exercise after your baby’s birth will also help you regain your pre-pregnancy shape and fitness level more quickly. Having a focus on core exercises both during pregnancy and after birth will assist you in staying strong while giving birth and then carrying your baby afterward. The key is to listen to your body and increase your exercise intensity gradually to return to your pre-pregnancy exercise routine. Your 2 week membership gives you access to The Gym, Cardio Theatre, All Group Fitness Classes, Unlimited Tanning, Towel Service, Lockers and more... Print your Trial Pass Today!! Gift Certificates for a gym membership are the perfect gift to give anyone from the avid gym-goer or someone who is just starting their regimen. 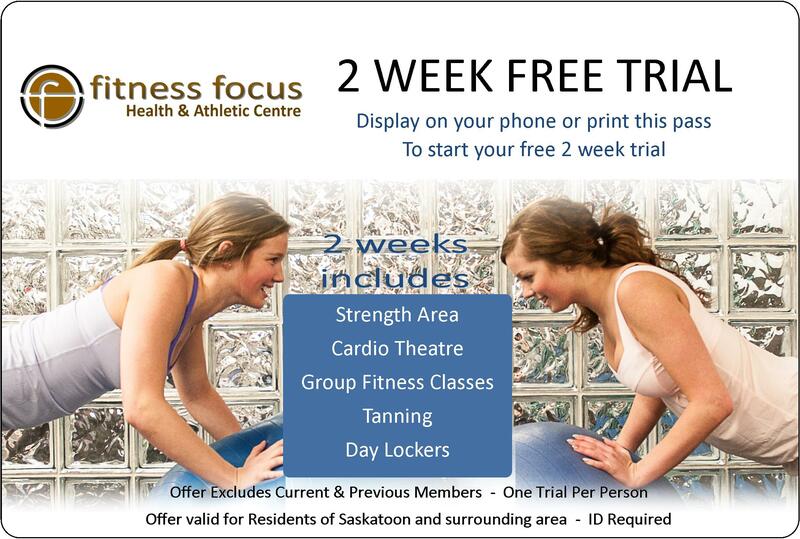 If you know someone in Saskatoon who is looking for a gym or someone with an existing membership at Fitness Focus; Gift Certificates are always available! Stop by Fitness Focus Health & Athletic Centre and pick up a Gift Certificate or purchase by phone today.